Seems like cell phone manufacturers are having a hard time keeping their products secret to the public. With the internet buzzing over the leaked photos of the iPhone 6 model LG wasn’t left behind, the LG G3 photos and specs has been leaked on the internet ahead of their launch. The LG G3 is the new flagship phone from LG which is much talked about because of its sheer power packed configuration. 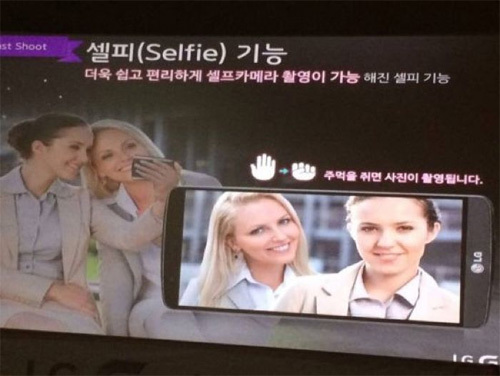 Photos were leaked from an LG G3 product launch event for South Korea that had pictures of the phone along with its configurations. The LG G3 will come with a 5.5″ QHD IPS screen and a Snapdragon 801 chipset with 3GB of RAM. The smartphone will be powered by Android 4.4 KitKat and will pack an optically stabilized 13MP main camera and a 2.1MP front-facing ‘selfie’ camera, along with USB 2.0, Bluetooth 4.0, NFC, GPS and GLONASS support. To power all these, LG G3 would use a large 3000mAh battery. The size of the phone is fairly on the larger side with a dimension of 146.3 x74.6×8.9mm. The Korean version would have a 32GB internal storage space with no support for external memory, this might however be different for the international market, and the international market is more than likely to get more variants for storage space and might or might not get support for external memory cards. With its sheer might and power LG G3 is all set to compete with the Samsung Galaxy S5 and even the Note 3. 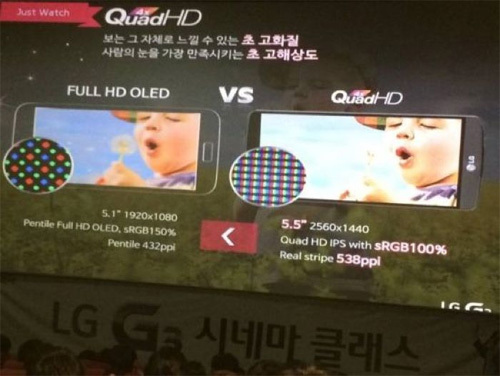 The Samsung S5 currently has the best display in the industry but the G3 is all set to take that place with their mighty display which looks significantly brighter and crispier in the leaked photos.